The kid still hasn't come out yet and there hasn't been much sign of anything happening as yet. Little beggar is trying to stay in long enough for Squatter's Rights to take effect. Too bad there are no such rights in Canada and the docs are going in on Monday if nothing happens before. At least that's the plan thus far. Just in case, I checked back and I gave the kid notice at least 30 days ago so all my bases are covered. No lawsuits! Easter was a good day here. Except for the still knocked up part. 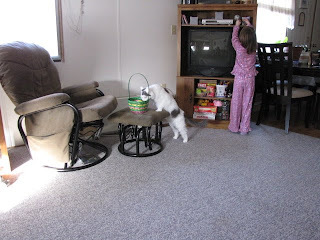 Girly had a blast looking for eggs and the cat followed the basket every where it went. He really wanted that string type stuff at the bottom. Apparently it makes a lovely snack. No worries, he went without, but he gave it the old college try! It's also been finishing time around here. I finished another Flapper Girl's Twist and a couple of other little hats. I ripped back a couple of old projects too. I just wasn't happy enough with them to finish the knitting. This is one of the projects that got finished. I like! 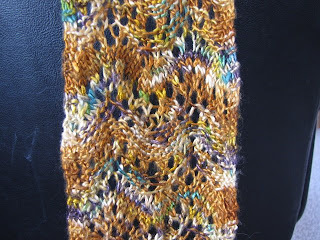 A simple scarf using the Porcupine Stitch from Barbara Walker's Second Treasury. Reversible and very easy to memorize. The yarn I used is gorgeous! I'm going to have to get another skein just for me. 1 Skein: Colinette Yarns Taos - 100% Silk in their Madras shade. Chosen by Girly while at Threads in Time in Thunder Bay. 3.25mm (US 3) needles - also selected by Girly from my needle collection. Repeat these 9 rows for 12 full repeats and end the 13th repeat on Row 2. Set this half aside and cast on 28 sts for the second half. Repeat the steps for the first half also ending the 13th repeat on Row 2. Graft the two halves together (Knitty Tutorial) then weave in ends and block. Someone liked. 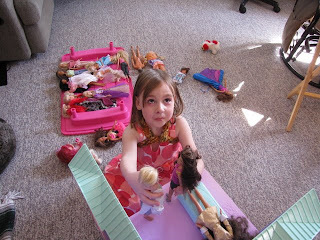 She pretended not to for a bit, but once I threatened to keep for myself, she changed her mind, posthaste. She wore it the next day too. She decided that it needs to be worn like this since it isn't really a scarf. It's a skinny top. Beautiful Beautiful! I think I have some yarn calling for this pattern! Thank you for sharing! 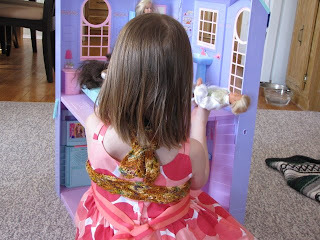 Kiddo, you really need to give your Mama a break. Every time you dilly-dally later in life, you may hear, "Oh, the feet dragging started at the very beginning. Let me tell you about the days right before you were born." Trust me, that will get old. Why not just pop out, experience sunlight and your loving family, and in no time chew on Colinette? 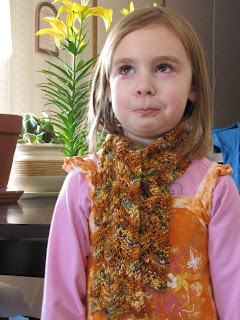 I'm dazzled by your Easy Ribbed Lace Scarf pattern. Oddly, I don't tire of its repetition...I find it relaxing. Finally a pretty lace pattern that I can manage! Thank you so much for sharing this pattern. I'm loving it. I'm being very patient baby, so come on out! I hope the kid puts in an appearance before Monday, but I have the funniest mental image of a pile of baby stuff on the curb.